Nick's work hours changed while we were away in Yowah. His previous shift-work roster always had short (and often longer) blocks of free time. Those breaks were much appreciated - and could be used as they occurred or to augment annual leave. Given those work changes, some of the packing for this trip was my responsibility. That's not to say I don't usually pack anything, I do - Nick looks after the larger items and I organise food, cooking gear, bedding, clothes and much other "stuff" - then Nick stows everything in Elmer (and the trailer). 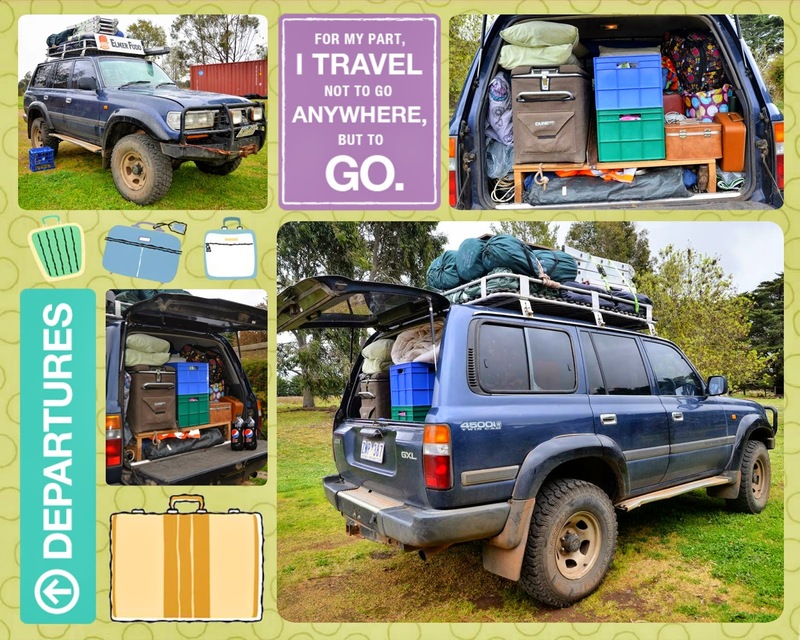 Our Innamincka and Charleville trips were our first using Elmer only for camping. We did OK and those experiences stood us in good stead when preparing for our latest adventure. Nick packed the roof on Wednesday, after work. Some camping mats, our stretchers, 4WD mats, chairs and table went up there - along with a bag of sleeping bags. Although we used a tarp for one our earliest trips, it developed "Priscilla" (Queen of the Desert) tendencies en route and we've since opted to use large garbage bags for weather-proofing roof items! Usually the bags are wrapped around the outside but I'd bought smaller bags in error, so adapted the method. I overlapped two bags (end for end) to cover our 4WD mats, before slipping them inside their regular covers. Nick liked the adaption and did our stretchers the same way. By the time Nick went to bed on Wednesday, all the roof items were packed and securely tied. He'd put an Engel fridge in the back as well as sorting all the lights, extension cords and similar items. My mission on Thursday morning was to finish packing, pick-up a few last-minute groceries and then collect Nick from work at 2:00pm. (I calculated I'd have to depart home at around 12:30pm, so got up at 5:30am, when Nick was leaving for work). These photos show my packing effort in varying states of progress. The large red suitcase held clothes (and towels) for Nick and I. Vaughan's clothes, bedding and towel were in the smaller red case. Erin used a small overnight bag for her belongings. Bedding for her (and us) was in the pink spotted bag. On these shorter trips, we use the red picnic case for all meals. You can see the beverage case in the top photo collage, packed near the door for easy access. There were two plastic boxes of food-stuff, one thermal cooker (carrying afternoon tea) and a filled thermos. 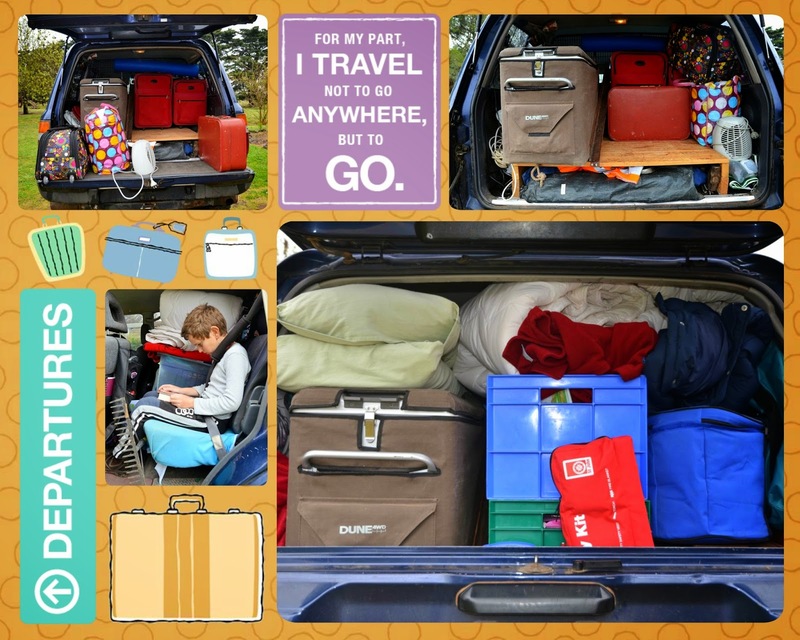 As Keegan didn't travel with us, I was able to use the back seat for some overflow gear. We'd been told we should bring a rake and I remembered that at the last minute, so slipped it across the rear foot-well - much to Vaughan's disgust! It was (the) Great (Ocean Road)!